One thing I'm guilty of is highlighting Kickstarters, good or bad, and then never returning them to the spotlight, which I think is a shame. Most of the good ones deserve a second look and some of the bad ones certainly have more sacrifices to make to the community on our behalf. The Monday Morning Kickstarter Update should be a weekly feature (although the title itself is subject to change). WHAT!? 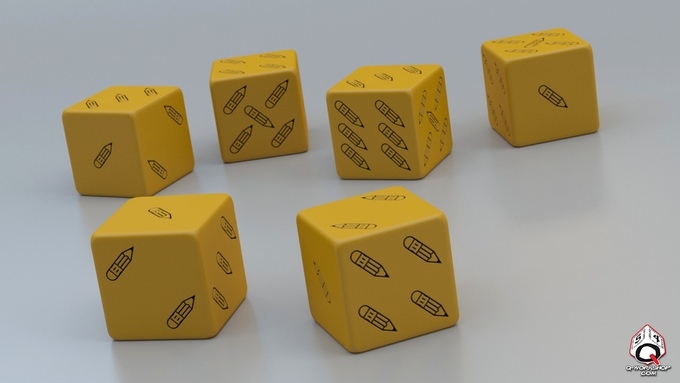 Pencil Dice - we all know about the Pencil Dice Kickstarters that Ken Whitman ran to further fund his Hollywood ambitions - the ones that never shipped a single pencil. Well, this is a Kickstarter that is thumbing it's nose right back at Ken: six-sided dice with images of pencils instead of pips. Sure, it's mostly a joke, but the dice are real. 18 days left in the funding window. Baby Bestiary Volume 2 & Vol. 1 Reprint - the amazingly beautiful and cute Baby Bestiary funded earlier this month and is now taking pre-order on Backer Kit. If you missed out on the KS this is your chance. Quests of Doom 3 - the Frogs are putting out a third volume in their series of adventures converted from 3x or Pathfinder to Swords & Wizardry and D&D 5e. Excellent value for your money. Definitely not crowdfunding but certainly crowdsourced, over the weekend The Tavern opened up a new forum called The Common Room. With the simple idea of being a place where old school publishers, bloggers and podcasters could get together to arrange for product reviews or giveaways of product, it has grown to include contact information for conventions, a listing area for reviews, forums for artists, writers, editors and layout specialists to offer samples of their work and much more. As I post this, 26 publishers have signed up (including some of the larger names in Old School Gaming - Frog God Games, Lesser Gnome, Goblinoid Games and so many more), 27 blogs, 1 convention (NTRPG) with another pending and one podcast. We need more podcasts! All in all, not bad for less than 48 hours after going live. I'm considering a forum for Old School Kickstarter listings, but I may lock that down so that only I can do the posts. Not sure yet and very much open to discussion. Are you a publisher of Old School Gaming material? Are you a blog that posts about Old School Gaming. Are you a fan of Old School Gaming and looking for a way to contact others in the hobby? The Common Room is there for you. Signing up is as simple as using the social media platform of your choice.